If you’re looking for WH question exercises to support your child’s speech therapy goals, you’ve come to the right place. We’re sharing our favorite WH questions worksheets and WH questions speech therapy activities below, as well as some at-home ideas for additional guided and independent learning, but before we get to those, let’s take a closer look at the development of WH questions in kids with autism and other developmental challenges and delays. Why are WH questions so important, and how can parents and teachers support the development of this language skill at home and at school? I first became aware of the importance of WH questions about a year and a half ago when I started chatting with another mom while at the park with my daughter. Our kids were around the same age and were having fun making ‘mud soup’ together, and since we were both very obviously in dire need of a little adult conversation, we ended up talking for a long time. We discussed school, extracurriculars, our favorite weekend haunts, summer camp and travel plans, and as our conversation started to wane, the sweet woman confided in me that her son has severe autism. He’d been in intense ABA, occupational, and speech therapy for the greater part of the prior 3 years, and with grade one looming in the not-so-distant future, she was feeling anxious. We spent the next 10 minutes or so discussing all of the different therapies her son had received since his diagnosis, and all of the progress he had made as a result. I remember feeling equal parts sad and fascinated as I listened to her, and the one thing that sticks out most in my mind about our conversation is when she told me he didn’t have any WH questions when they initially started therapy. I must have looked at her blankly when she told me this as the importance of WH questions was completely lost on me, but I’ve since learned the role WH questions play in the development of our children. While most children naturally start to develop WH questions when they reach age 2, children with autism and other speech delays don’t always learn this skill on their own and must be taught by a trained speech therapist with supportive efforts from parents, teachers, and caregivers. Who, What, When, Where, Why, and How?! The good news is that the internet is full of fun and effective WH question exercises, activities, and worksheets for therapists and teachers to try, and when I did a search on Teachers Pay Teachers – my favorite resource for all things related to teaching and special education – I found some REALLY great ideas that I’m excited to share with you. I broke these down into 3 categories – speech therapy activities, WH question exercises to try at home, and worksheets for guided and independent learning. You’ll notice that almost all of these WH question exercises and worksheets are available for purchase for a small fee, and while I try to encourage my readers to create their own activities to save on costs wherever possible, I just didn’t feel any of the free options I found online were a solid match as these resource require absolutely NO prep work on your part. All you have to do is print and go, although you may want to invest in a laminator and some dry erase markers so you can use these items over and over again. Grab your bingo daubers (or bingo chips) and have fun with this brilliant bingo game! What I love most about this set is that it has a game for each type of WH question (who, what, why, when, where) as well as a mixed game to help children learn to discriminate question types in a FUN way. This is one of my favorite WH questions for speech therapy activities, and it’s free! You’ll want to invest in a laminator before purchasing this game as the awesome kids in your life are sure to want to play this one over and over again. Developed by the same teacher who created the WH Questions Pizza Party activity above, this is another one of my favorite WH questions for speech therapy activities. With 25 picture scenes, 450 corresponding question cards, and 96 generic WH questions cards for higher functioning students, you’ll get a lot of use out of this one! Big Picture Scenes: WH Questions, Inferences, etc. With 44 cards and 5-8 WH, logical, inference, predictive, and/or personal questions for each, this is a great speech therapy activity to help kids develop their WH question skills! With 100 reading passages, 100 questions and response sets, and 100 activity sheets, this is a great activity for older kids to practice listening for details to develop their listening comprehension skills. To make this extra fun, kids can use a bingo dauber to stamp their answers! This set includes over 100 flip cards divided into 3 levels – picture only, picture and word, word only – and they are the perfect at-home learning activity to support a child’s WH question goals. If you’re looking for on-the-go WH question exercises for kids with autism, this is a great resource to consider. Perfect for use when traveling to support a child’s WH question goals, this set is compact yet effective! With over 200 task cards to choose from, this bundle is designed to build conversation skills, comprehension abilities, vocabulary, and overall academic knowledge. A child can work on these WH question exercises independently or with a partner, or you can use these tasks cards for guided instruction and practice. Designed for kids in preschool through grade 2, these visual scenes offer a fun way to teach kids how to ask and answer WH questions. With 9 scenes and 90 WH questions, you will have hours of educational fun with these. Print, laminate, and have children use dry erase markers to circle their answers so these WH question scenes can be used over and over again! I stumbled upon this book multiple times while searching for WH question exercises, activities, and worksheets, and after reading through the material, I love the approach this resource uses. Through 24 scene pages and leveled directions, students will learn what the different types of WH questions mean through simple pictures. Click over and take a look – you won’t be disappointed! Perfect for speech therapists, this 70-page no-prep workbook introduces the concept of WH questions, explains the differences between WHO, WHAT, WHEN, WHERE, and WHY questions, and gets progressively harder with each lesson. This bundle has over 150 worksheets, all with fun illustrations, to use in therapy or at home! This set begins with 40 picture comprehension questions, moves to 40 sentence comprehension questions, and finishes with 40 paragraph comprehension questions, and I love that it includes a data tracking sheet for each section so you can monitor progress over time. This is a great bundle to consider if you want to work on reading comprehension, independent work skills, answering WH questions, fluency, and fine motor skills. With 200 booklets in this bundle, it provides enough material for an entire school year with data sheets to help track how a child progresses over time. Designed for kids in preschool through grade 3, this is a great WH questions worksheets bundle as it helps students develop a range of skills, including decoding, fluency, and comprehension. The layout of each worksheet is the same, which will help students build their independence in working through these worksheets over time. I hope this collection of WH questions speech therapy activities, WH questions exercises, and WH questions worksheets proves useful to you in your quest to help develop language and comprehension skills in the exceptional children in your life! 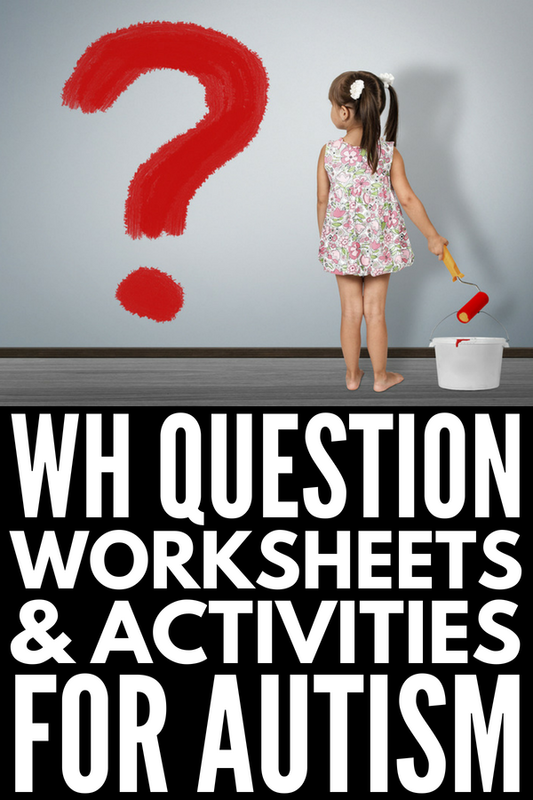 If you found this collection of WH questions exercises, activities, and worksheets helpful, please share this post on Pinterest! And if you’re looking for more autism-related ideas, please follow our Autism and SPD board where we share all kinds of great tips, tricks, and activities we find each day!